I’m helping my old friend Charlie Peverett with his new solo project Swan Steps, which has some beautiful songs. We recorded his first track ‘I’ll Be The Line’ live in Firle Village Hall and I made a lyric video, so here it is. It’s shot on iPhone 4, done in a single take, on the local train line between Norwich and Great Yarmouth, across the Broads. I’ve added a new Tumblr feed called Bingo Memes, as a home for any stupid jokes (mostly political, mostly rude) that I throw onto the interwebz. 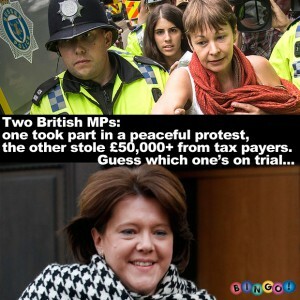 A couple of them have already really taken off, especially this pic comparing Maria Miller to Caroline Lucas which went extremely viral (100k shares in 12 hours) a few weeks ago, just before I went on tour. I guess it’s mainly an exercise to learn how to make them as good as possible, ahead of next year’s UK General Election. I’ve started a new art-based Tumblr photo feed called Art In The Open. I enjoyed running the daily feed for the Royal Pavilion & Museums last summer, so while I was touring I wanted to find a way to continue that process of noticing. So this is random pieces of public art and street art that I spot around the place. Obviously it’ll be more often updated when I’m on tour, since we cross paths with a lot more of that stuff when we travel. I hope you like it. If you do, please subscribe and share it.